First let me thank All of you who had sent get well wishes for my Mom. She is not coughing near as much today so thats a very good sign!! I am feeling better too so thank you again! I then made a little quilt sandwich with some batting and thin cotton for the backing. I then sewed all the way around and also added some ruched pink ribbon around the border. 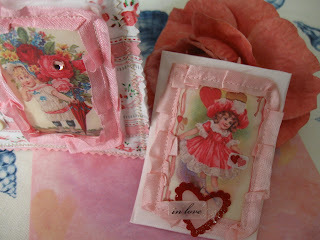 I then attached the little puffy picture bundle to a pink satin background. I added a couple of embellishments too. I also made a little ATC Fabric book holder. I has inside a couple of pockets for little love notes and the other side to hold the ATC!! I think it's all so cute! Nicole my partner likes it as well. I will share Nicole's ATC when I receive it.